Description: Small submersible oil-filled pump with epoxy coated cast aluminum housing. For commercial, industrial and home applications including statuary fountains, water displays, air conditioners, machine tool coolants, and many other applications where liquid must be transferred or recirculated. This compact 300 GPH pump features a 1/4" MNPT discharge, 11.8' shut-off head capab.. Description: The 5-MSP is Little Giant's most versatile and portable utility pump with oil-filled motor and epoxy coated cast aluminum housing. The permanently lubricated utility pump includes a garden hose adapter and removable inlet screen for easy cleaning. This pump provides efficient, trouble-free service for extended or continuous use in moving large volumes of water. .. Please contact us for a freight quote. Features: 126 GPM Honda GX - 240 High Pressure Pump A medium-size high pressure pump that will work in almost all high-pressure applications Is sized perfectly for the new US Coast Guard portable fire fighting specification Use for home and business portable stand by fire fighting Oil alert protects the engine from low engine.. This Honda-powered trash pump boasts a host of standard features for superior performance across the board. One-man operation to use in various dewatering applications when you have debris in the water. Lightest trash pump in the Multiquip fleet. Dual 2-inch discharge ports. MAX Solid discharge size: 1-inch diameter. Pumps up to 211 gallons (800 liters) per minute. Improved me.. Please contact us for a freight quote. The QP4TH is the perfect choice for larger pumping applications. Powered by an easy-start Honda 10.7-HP engine it is the preferred choice for dependable dewatering. Four handles on the frame means easy handling. An optional wheel kit is also available. Features to tackle the toughest requirements of the Pro Contractors. Trusted 10.7HP Hon..
Multiquip ST2040T Features: This portable 2-inch (50 mm) submersible pump is best for removing water from confined areas. 40 feet (12.1 meters) of maximum head Double mechanical oil-filled seals for improved reliability Neoprene impeller nuts over cast iron for improved wear ability UL/CSA approved Thi..
INCLUDES: (1) Pump FEATURES: Built-in Overload Protection. Pumps Liquid Up To 120° F. Dewaters Surfaces Up To 1/8” Levels. Rated for 4,500 Hours of Intermittent Duty. SPECIFICATIONS: .25HP, 115V/2.5A, UL & CUL Listed Electric Motor. 1-1/4” (NPT) Male Discharge with 1-1/4” Female Adapter and Thermoplastic Garden Hose Adapter. Total ..
Lightweight, portable, single phase submersible pumps are designed to handle water and solids. Built for the demands of construction, mining, municipality and farm applications. Features Insulation on all conductors of the power cable are protected by a water block system to prevent wicking of water into the motor. 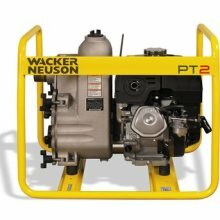 Silicon carbide faced double mechanical seals run in..
Wacker Neuson's centrifugal trash pumps have proven themselves on jobsites around the world. With an optimized impeller design and built-in contractor friendly features, this line of trash pumps has redefined the quality and durability standards of self-priming centrifugal trash pumps. Self-priming high performance pump capable of handling solids up to 1 inch, ideal for most jo.. Please contact us for a freight quote. 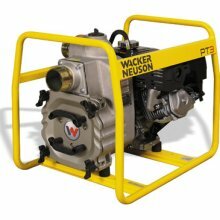 Wacker Neuson's centrifugal trash pumps have proven themselves on jobsites around the world. With an optimized impeller design and built-in contractor friendly features, this line of trash pumps has redefined the quality and durability standards of self-priming centrifugal trash pumps. Quality components such as carbon ceramic mechanic.. Description: This lightweight, compact submersible centrifugal pump is ideal for moving water in multiple confined and open area applications. This is a powerful, versatile, low maintenance pump that is perfect for a wide range of operations supporting Contractors, Service Utilities, Municipalities, and Homeowners. Further, the ST2037 incorporates a rugged cast aluminum housing, internal thermal ..
Multiquip ST2047 2" Submersible Pump 110V, Single Phase. It's portable, lightweight and reliable. Multiquip's ST2047 also has improved impeller-wear making it the perfect choice for applications with sandy water and higher heads. Features and benefits Double mechanical oil-filled seal minimizes chances of motor damage. Maximum head of 47 feet (14.3 meters). Total w..
Flex Vane 12 Volt Transfer PumpPortable 12v Dc Non-submersible Transfer PumpStainless Steel Pump Head & Steel Motor CoverIncludes Battery ClipsPumps Up To 360 Gallons Per Hour1 Year WarrantyColor:white..
Red Lion Gas Powered Utility PumpIdeal For Liquid Transfer Including Most -Agricultural Chemicals Plus Up To 5/8" SolidsHeavy-duty Cast Iron Pump Casing With Durable -Cast Iron Semi Open Type ImpellerStainless Steel Shaft Sleeve & Fkm Seal2"npt Suction & Discharge For Convenient HookupPowered By Kohler(r) Courage 196cc Ohv EngineSelf Priming To 25 Ft. - Flow Rate To 170 GpmColor:red/black..
1.1 Gpm Condensate Removal PumpRemoves Condensation From Air Handlers, -Boilers & Furnaces To Vertical Height Of 15 Ft.High-impact Abs Thermoplastic ConstructionRust-proof & Suitable For High-efficiency -Gas Furnaces - Built-in Check ValveDesigned For Ease Of MaintenanceThermal Overload Protection - W/safety Switch1.0 Amp - 115v - 1/2 Gal. Tank Capacity..
Red Lion Convertible Jet PumpIdeal For Fresh Water Supply To Home, Farm,-& Cabins That Have Suction Lifts Down To 90 Ft.Features: Rugged Cast Iron Casing, 1-1/4" Npt -Suction, 1" Npt Discharge, 30/50 Pressure -Switch, Deep Well Injector, Venturi, Nozzle -& Brass Flow Control Valve IncludedGlass Filled Thermoplastic Impeller & DiffuserCan Be Set For Use With 115v Or 230vSize:1/2 HpColor:red..
Red Lion Convertible Jet PumpIdeal For Fresh Water Supply To Home, Farm,-& Cabins That Have Suction Lifts Down To 90 Ft.Features: Rugged Cast Iron Casing, 1-1/4" Npt -Suction, 1" Npt Discharge, 30/50 Pressure -Switch, Deep Well Injector, Venturi, Nozzle -& Brass Flow Control Valve IncludedGlass Filled Thermoplastic Impeller & DiffuserCan Be Set For Use With 115v Or 230vSize:3/4 HpColor:red..
Red Lion Shallow Well Jet PumpIdeal For Fresh Water Supply To Home, Farm,-& Cabins That Have Suction Lifts Down To 25 Ft.Pump Features: Self Priming, Rugged Cast Iron -Casing, 1-1/4" Npt Suction, 1" Npt Discharge30/50 Psi Pressure Switch W/pressures To 66 PsiGlass Filled Thermoplastic Impeller & DiffuserCan Be Set For Use With 115v Or 230v2 Year Over-the-counter WarrantySize:1/2 HpColor:red..
Red Lion Shallow Well Jet PumpIdeal For Fresh Water Supply To Home, Farm,-& Cabins That Have Suction Lifts Down To 25 Ft.Pump Features: Self Priming, Rugged Cast Iron -Casing, 1-1/4" Npt Suction, 1" Npt Discharge30/50 Psi Pressure Switch W/pressures To 66 PsiGlass Filled Thermoplastic Impeller & DiffuserCan Be Set For Use With 115v Or 230v2 Year Over-the-counter WarrantySize:3/4 HpColor:red..
4" - 3/4 Hp 2 Wire Submersible Well PumpPowered By Franklin Electric Industry Standard -Motors For Reliability3/4 Hp 2 - Wire ModelThermoplastic Discharge And Motor BracketStainless Steel Pump ShellBuilt-in Suction Screen And Check Valve12 Gpm Pumping Capacity3 Year WarrantySize:3/4 HpDesc:230 Volt..
4" - 3-wire Submersible Well Pump3-wire Pumps Supplied With Franklin Electric -Motor And Includes Control Box3-wire / 230 Volt OperationThermoplastic Discharge And Motor BracketStainless Steel Pump ShellBuilt-in Suction Screen And Check Valve3 Year WarrantySize:3/4 HpDesc:12 Gpm Capacity..
4" - 3-wire Submersible Well Pump3-wire Pumps Supplied With Franklin Electric -Motor And Includes Control Box3-wire / 230 Volt OperationThermoplastic Discharge And Motor BracketStainless Steel Pump ShellBuilt-in Suction Screen And Check Valve3 Year WarrantySize:1 HpDesc:12 Gpm Capacity..
1/4 Hp Submersible Utility PumpRed Lion Lightweight & Portable Utility PumpPumps Up To 1300 Gallons Per HourCorrosion Resistant Aluminum CasingRemovable Filter ScreenOil-free Motor DesignIncludes 3/4" Garden Hose Adapter3/4" Discharge With Garden Hose AdapterSize:1/4 HpColor:red/black..
Red Lion 1/6 Hp Utility PumpSubmersible 115 Volt Utility PumpReinforced Engineering Thermoplastic ConstructionScreened Bottom Intake DesignPumps Down To 1/4" DepthUp To 1200 Gallons Per Hour Depending On Lift2 Year WarrantySize:1/6 HpColor:black.. Lawn & Turf Irrigation PumpIdeal For Pressure Boosting, Sprinkler Systems,-And General Purpose ApplicationsRugged Cast Iron Casing, Suction Check Valve, -High Efficiency Thermoplastic Impeller, With -2" Suction And 1-1/2" DischargeSelf Priming To 25 Feet-max Pressures To 59 PsiFlow Rates Up To 89 Gpm Depending On LiftCan Be Set For Use With 115v Or 230vSize:2 HpColor:red.. Decorative Water Application (pond) PumpF-series wet rotor canned motor (1.25 Amp) -pump can be used submersed or externallyWater circulates rotor housing to run coolerCan be mounted vertically or horizontallyPre-filter included for flexibility/durabilityConstructed without mechanical seal or oil1.5" MNPT threads & SPIG discharge & inletRope/cable loop for deep installation retrievalSIZE:115 Volt/..
Little Giant Statuary / Fountain Pump2.5 Watt motor designed to operate continuously-with minimal energy consumption - 0.03 AmpsMagnetic-drive pump - offers a corrosion -resistant body specifically for submersible useBuilt-in adjustable flow control, ceramic shaftfor longer life - easy to install & maintainDischarge barb: 1/2", 3/8" - 6 foot cordDimensions: 1.9"D x 1.16"H x 1.7"WCAPACITY:40 GPHCOL..
Little Giant Statuary / Fountain Pump8 Watt motor designed to operate continuously -with minimal energy consumption - 0.14 AmpsMagnetic-drive pump - offers a corrosion -resistant body specifically for submersible useBuilt-in adjustable flow control, ceramic shaftfor longer life - easy to install & maintainDischarge barb: 1/2", 3/8" - 6 foot cordDimensions: 2.8"D x 2.3"H x1.9"WCAPACITY:80 GPHCOLOR:..
Little Giant Statuary / Fountain Pump11 Watt motor designed to operate continuously-with minimal energy consumption - 0.23 AmpsMagnetic-drive pump - offers a corrosion -resistant body specifically for submersible useBuilt-in adjustable flow control, ceramic shaftfor longer life - easy to install & maintainDischarge barb: 1/2", 5/8" - 6 foot cordDimensions: 3.5"D x 3.2"H x 2.8"WCAPACITY:130 GPHCOLO..
Little Giant Statuary / Fountain Pump23 Watt motor designed to operate continuously-with minimal energy consumption - 0.40 AmpsMagnetic-drive pump - offers a corrosion -resistant body specifically for submersible useBuilt-in adjustable flow control, ceramic shaftfor longer life - easy to install & maintainDischarge barb: 1/2", 5/8" - 6 foot cordDimensions: 3.7"D x 3.6"H x 2.7"WCAPACITY:290 GPHCOLO..
Little Giant Statuary / Fountain Pump33 Watt motor designed to operate continuouslywith minimal energy consumption - 0.64 AmpsMagnetic-drive pump - offers a corrosion -resistant body specifically for submersible useBuilt-in adjustable flow control, ceramic shaftfor longer life - easy to install & maintainDischarge barb: 1/2", 5/8" - 6 foot cordDimensions: 4.2"D x 3.6"H x 2.7"WCAPACITY:380 GPHCOLOR.. FLOAT SWITCHRated at up to 15 ampsPiggy-back plug connectionFor 115-volt operation8 ft. power cordIdeal for any sump pumpNormally open - maintains vessels emptyMounting straps included..
11" BRASS TANK TEELead-free brass construction tee11" long to reach out from under wider tanksTapped with two 1/4" NPT holes for -attachment of accessories90-day limited warrantySIZE:11".. CHECK VALVE KIT1-1/4" or 1-1/2" kitFor use with rigid pipePrevents back-flow of water into pitIncludes all clamps & adapters..
1" BRASS CHECK VALVELead-free brass construction valve1" NPT threaded connectionsPoppet style with stainless steel spring90-day limited warrantySIZE:1".. CHECK FULL FLOW VALVEFor sewage pumpsSIZE:2"..
CONTROL BOXUL listedFranklin brandUniversal useUse #FP417-1173 capacitor for replacement3/4 HP..
PRESSURE SWITCH40/60 pressure settingsOn at 40 psi and off at 60 psiQuality constructionWorks on jet pumps or 4" submersibles..
3/4 HP SHALLOW WELL JET PUMPCast iron jet pump has superior performance -at depths to water of 25 feet or lessRugged, heavy-duty cast iron housingReady-to-install 230 volt motor can be -converted to 115 volt1-1/4" NPT suction & 1" NPT discharge pipe sizesCapacities" 25 ft. lift, 70 PSI & 8.5 GPMJet kit includedSIZE:3/4 HP..
SEWAGE BASIN COVERMade of heavy-duty composite materialFits FPW 73-15 sewage basinIncludes seal kit PW198-3DESC:Basin CoverCOLOR:.. CHECK VALVEThread in direct connect check valveDouble-threaded for use with 1-1/4" or -1-1/2" sump pump dischargesDischarge side designed to allow discharge -hose to clamp directly in placeBuilt-in anti-airlock hole means less chance -of your pump air-lockingSIZE:1-1/4"..
You will receive 1 units when you purchase this productSIMER 1/3 HP SUBMERSIBLE SUMP PUMPSubmersible sump pump with vertical switchOperates in 10" basins or largerThermoplastic construction resists corrosionZinc motor housing dissipates heat quickly1-1/2" NPT discharge will handle 3/16" solids3,600 GPH maximum with maximum lift of 22 ft.Comes with 8 ft. grounded power cordSIZE:1/3 HPCOLOR:Black/Si..
You will receive 1 units when you purchase this product1 HP CONVERTIBLE DEEP WELL JET PUMPSimer(R) cast iron construction jet pumpSuperior performance at depths to water -of 70 ft. or less - 13.5 GPM @ 10 ft. liftReady-to-install, heavy-duty, 1 HP motor230/115V AC - preset at factor for 230 VoltSelf-priming after pump housing is filledCheck valve or foot valve is requiredPre-wired 30/50 switch - e..
You will receive 1 units when you purchase this productSIMER 1/4 HP SUBMERSIBLE SUMP PUMPSubmersible sump pump with tethered switchOperates in 14" basins or largerThermoplastic construction resists corrosionZinc motor housing dissipates heat quickly1-1/2" NPT discharge will handle 3/16" solids3,200 GPH maximum with maximum lift of 20 ft.Comes with 8 ft. grounded power cordSIZE:1/4 HPCOLOR:Black/Si..
You will receive 1 units when you purchase this productSIMER 1/2 HP SUBMERSIBLE UTILITY PUMPThermoplastic utility pump for temporary use inremoving unwanted water from flat rooftops,-window wells or shallow depressionsMade of tough thermoplastic & stainless steelSimple plug-in operation - 8 ft. cordPumps down to 7/16" - 1-1/4" male BSP dischargeIncludes barbed and garden hose adaptersFlow at 10' l..
1 HP 4" SUBMERSILBE WELL PUMPEconomical & energy efficient pump for 4"wellsProvides optimum amount of water & pressure -for general home & farm use: 15.6 GPM capacityOperating range: 10 to 300 ft.Floating stack design for sand resistanceCorrosion-resistant stainless steel pump-and motor housing / 230 Volt - 3 wire + groundMaximum PSI: 170 - Discharge size: 1-1/4" NPTSIZE:3-7/8" DiameterFINISH:Stai.. DRILL PUMPPumps to 216 GPHAttaches to min. 1,200 RPM electric drillIdeal for emergency pumpingDrains aquariums & waterbeds..
PORTABLE GAS ENGINE UTILITY PUMP5-1/2 HP over head valve engineBuilt-in fuel gauge, low oil safety cut-off2" discharge opening - should not be reducedUp to 58 PSI or 150 gallons per minuteManual throttle, choke, fuel valve and-engine shut-off controls135 ft. discharge lift or 25 ft. suction liftBuilt-in check valve, dual oil dipsticks..
1-1/4" BRASS & STAINLESS FOOT VALVECorrosion resistant lead-free brass bodyStainless steel screen1-1/4" NPT threaded connection90-day limited warranty..
2-WIRE W/GROUND SUBMERSIBLE CABLE150 ft. 2-wire pre-cut cableHeat shrink splice kitSpecial UF approved jacketed wires..
You will receive 1 units when you purchase this productFLOTEC 3/4 HP H-O SUBMERSIBLE SUMP PUMP3/4 HP high output pump with vertical switchCorrosion resistant zinc constructionDissipates heat quickly & extends motor lifeUni-body motor housing eliminates leak pointsQuadra Seal(TM) technology for motor protectionVertical switch operates in 10" basins or larger4,980 GPH flow at 10 ft. lift - 6,600 GPH..
THERMOPLASTIC UTILITY PUMPNon-corrosive thermoplastic construction pumpresists impact, stress and heatMaximum pumping capacity is 900 GPH with -480 GPH with discharge height of 10 ft.Built-in overload protection with auto resetEasy installation, includes 8 ft. cord -& garden hose adapter - pumps down to 3/16"UL and CUL certified - 1 year warrantySIZE:1/6 HPCOLOR:Black..
You will receive 1 units when you purchase this productFLOTEC 1/2 HP H-O SUBMERSIBLE SUMP PUMP1/2 hp high output pump with vertical switchCorrosion resistant zinc constructionDissipates heat quickly & extends motor lifeUni-body motor housing eliminates leak pointsQuadra Seal(TM) technology for motor protectionVertical switch operates in 10" basins or larger4,140 GPH flow at 10 ft. lift - 6,000 GPH..
GEYSER III UTILITY PUMPRugged thermoplastic bodyReplaceable 8 ft. cord with grounded plugMotor with thermal overload protectionVent relief prevents air lockGarden hose adapter included115 volt, 10 amp1620 GPH at 10 ft.SIZE:3/10 HP.. SHALLOW WELL JET KITConverts FP4300 series deep well Jet Pump -for shallow well applications up to 25 ft.Corrosion-resistant clamp-on jet kit..
PRESSURE BOOSTER PUMPTotal home water pressure booster systemMaximum additional pressure 40 psiFully automatic system increases and-maintains household water pressureAssembled, ready to install-includes 6 ft.-115-volt power cord - maintenance free motor1" female NPT intake and 1" male NPT dischargeStainless steel pump housing on mounting base..
12 VOLT MINI VAC PUMP12 volt permanent magnet type motorIncludes: pump, motor, 6 ft. suction hose-and Pud-L-ScoopMax pumping capacity to 600 gallons per hourPumps floor dry to 1/8"10' cable leads w/ color coded battery clamps90 day warrantyExtra impeller kit included.. SHALLOW WELL JET PUMPSuperior performance at 25 ft. to water or lessCapacities to 10 GPM @ 40 PSIReinforced thermoplastic fiberglass pump housingSelf-priming after pump housing initially filledPre-set pressure switch to 30-50 psi settingPressure shut-off at 78 psi115/230 voltsTC2104 pressure gauge recommendedSIZE:3/4 HP..
You will receive 1 units when you purchase this product1/2 HP CONVERTIBLE DEEP WELL JET PUMPSimer(R) cast iron construction jet pumpSuperior performance at depths to water -of 70 ft. or less - 9GPM at 10 ft. liftReady-to-install, heavy-duty, 1/2 hp motor115/230V AC - preset at factory for 115 VoltSelf-priming after pump housing is filledCheck valve or foot valve is requiredPre-wired 30/50 switch -..
You will receive 1 units when you purchase this productFLOTEC 3/4 HP SUBMERSIBLE SUMP PUMPPro Series sump pump with vertical switchRugged cast iron construction for longer lifeSmooth/quiet operation energy efficient PSC motEnergy-efficient PSC motor for smoother, -quieter operation - rust-proof impeller67 GPM flow at 10 ft. lift - 88 GPM capacitySump minimums: 10" diameter - 10" depth6.3 Amp, 115 ..
3/4 HP CAST IRON SEWAGE PUMPPro Series sewage pump with tethered switchRugged, cast-iron construction for longer lifeSmooth, quiet, energy-efficient PSC motorRust-proof impellerSump Minimums: 18" diameter - 30" depthMaximum solid handling size is 2"Flow rate at 10 ft. lift is 125 GPM9 Amp, 115V -10' cord - CSA & CUS ListedSIZE:3/4 HPCOLOR:Black..
You will receive 1 units when you purchase this productFLOTEC 1/2 HP SUBMERSIBLE SUMP PUMPPro Series sump pump with vertical switchRugged cast iron construction for longer lifeSmooth/quiet operation energy efficient PSC motEnergy-efficient PSC motor for smoother, -quieter operation - rust-proof impeller61 GPM flow at 10 ft. lift - 80 GPM capacitySump minimums: 10" diameter - 10" depth6 Amp, 115 Vo.. DEEP WELL PUMPPump wires direct to pressure switchRequires no control box, 2-wire, 240VIncludes built-in check valvePumps 9.4 GPM at 150 ft.Pumps up to 200 ft.SIZE:3/4 HP..
You will receive 1 units when you purchase this product1/3 HP SUBMERSIBLE SUMP PUMPRugged cast iron base & corrosion-resistant -zinc body for heavy-duty applicationsHas thermal protection against overloadsOperates in 10" or larger basinVertical On/Off float switch4,200 GPH - Maximum lift: 22 ft. w/1/4" solids1-1/2" NPT dischargeComes with 8 ft. ground power cordSIZE:1/3 HPCOLOR:Black/Silver..
75 PSI PRESSURE RELIEF VALVEFactory pre-set at 75 psi pressure relief valveDesigned to release excess pressure in a -controlled way in order to protect water -system pipes and fixturesLead-free brass body with stainless steel -internal parts1/2" and 3/4" NPT threaded female connections90-day limited warranty..
SPLICE KIT3-pack wire splice kitSubmersible..
PRESSURE GAUGEFor use on all well systems0-100 PSI..
SEWAGE BASINTwo 2" top in-out ports3" side inletMade of heavy-duty composite materialLid & seal kit not includedSize: 18" x 30"DESC:Basin..
30/50 PRESSURE SWITCH W/CUT-OFFTurns pump on at 30 psi and off at 50 psiLow pressure cut-off shuts off power to pump -if pressure drops below 20 psiManual reset allows you to inspect system -before restarting pump1/4" NPT female connection90-day limited warranty..
You will receive 1 units when you purchase this productFLOTEC SUBMERSIBLE PUMP CONTROL BOXReplacement control box for FP3232 -submersible well pumpFits 3 wire model onlyMotor and box manufactured by Pentair Pump230 Volt..
MINI VAC PORTABLE UTILITY PUMPMulti-purpose pump for emergency dewatering,-draining aquariums, waterbeds & clogged sinksMax pumping capacity to 350 gallons per hourSelf-priming at 8 to 10 ft. verticallyPumps floors dry to 1/8"Includes: 6 ft. garden hose, Pud-L-Scoop-suction attachment and 6 ft. power cord90 day warrantySIZE:1/12 HPDESC:115 V AC..
CONTROL BOXUL listedFranklin brandUniversal useUse #FP417-1172 replacement capacitor1/2 HP..
You will receive 1 units when you purchase this productFLOW 'N STOW(TM) UTILITY PUMP KITSimer(R) multi-purpose household pump kitEasy to use & easy to store for quick & -easy complete household water removal needsComes with 1/4 HP utility pump, hose adapter,-18 ft. high capacity 1-1/4" discharge hoseAll packed in handy storage crateGreat for household emergencies, aquariums etc.Pump capacity:1524 ..
3-WIRE SUBMERSIBLE CABLE12 gauge wire - 150 ft. length3-wire kit with groundSpecial water well jacketIncludes connectorsFor deep well submersible pumps..
PORTABLE UTILITY PUMPDurable cast iron pump housing w/corrosion -resistant motor housing / lightweight & portable1/2 HP high speed motor has 1450 GPH maximum -pumping & 1270 GPH capacity at height of 15 ft.Includes Pud-L-Scoop(R) suction attachment -to pump down to 1/8" water levelHas 10 ft. cord and brass hose adaptersCarry handle for easy transport - 1 year warrantySIZE:1/2 HPCOLOR:Black..
MARK II SUMP PUMPThermoplastic body resists stressAutomatic thermal overload protectionVertical float switchSwitch on level @ 7-1/2" / Off at 2-1/2"Minimum sump diameter is 11" - depth of 10"Discharge pipe size: 1-1/4" MNPT / 115V 10Amp1620 GPH at 10 ft.SIZE:1/3 HP..
1/4 HP SUBMERSIBLE UTILITY PUMPSimer Geyser(R) classic utility pumpHeavy-duty cast aluminum constructionReplaceable 8 ft. cord with grounded plugDischarge 1-1/4" male NPTGarden hose adapter included115 Volt AC, 60 HzPumps 1020 GPH at 10 ft.2-year limited warrantySIZE:1/4 HP.. CAST IRON SHALLOW WELL JET PUMPShallow well jet pump can pull water -from maximum of 25 feetMaximum capacity: 12.5 GpmCapacitor start 115/230 dual voltage motorContinuous duty square flanged motorThermal overload protectionCast-iron pump housingSuction size 1-1/4" NPT - discharge 1" NPTSIZE:3/4 HP..
SEWAGE PUMPAutomatic thermoplastic submersible sewage pump2" discharge, 4/10 HP motorPumps up to 5250 GPHPasses 2" solidsIncludes 10 ft. power cord1 year warrantyUL listedDESC:4/10 HP..
You will receive 1 units when you purchase this productFLOTEC 3/4 HP H-O SUBMERSIBLE SUMP PUMP3/4 HP high output pump with vertical switchCorrosion resistant zinc constructionDissipates heat quickly & extends motor lifeUni-body motor housing eliminates leak pointsQuadra Seal(TM) technology for motor protectionVertical switch operates in 10" basins or larger4,500 GPH flow at 10 ft. lift - 6,360 GPH.. DRILL PUMP & HOSE KITPumps to 216 GPHAttaches to min. 1,200 RPM electric drillIdeal for emergency pumpingDrains aquariums & waterbedsIncludes 30" hose & connectionsAlso includes oil changing kit..
You will receive 1 units when you purchase this productFLOTEC 1/2 HP H-O SUBMERSIBLE SUMP PUMP1/2 HP high output pump with tethered switchCorrosion resistant zinc constructionDissipates heat quickly & extends motor lifeUni-body motor housing eliminates leak pointsQuadra Seal(TM) technology for motor protectionTethered switch operates in 14" basins4,140 GPH flow at 10 ft. lift - 6,000 GPH max.115VA.. SHALLOW WELL JET PUMPSuperior performance at 25 ft. to water or lessCapacities from 4.0 at 25 ft. to 7.4 gpm at 5 ft.Reinforced thermoplastic fiberglass pump housingSelf-priming after pump housing initially filledPre-set pressure switch to 30-50 psi settingPressure shut-off at 77 psi115 voltsTC2104 pressure gauge recommendedSIZE:1/2 HP..
JET PUMP TANK SYSTEMEnergy-efficient 115V 7.2 amp motorPressure switch pre-wired to 30-50 PSI7 gal. (15 gal. equivalent) pre-charged tankMaximum pumping capacity: 12 GPM1" NPT suction and discharge30/50 pressure switchPre-assembled and ready to install1 year warrantySIZE:1/2 HP..
4" DEEP WELL JET KITCast iron 4" double pipe injector kitFits Flotec models FP4332, FP4322 and FP4312Includes all interchangeable nozzlesFor depths over 25 ft. and up to 110 ft.Mounts at 5 ft. off bottom of wellComplete installation instructions.. DEEP WELL SUBMERSIBLE PUMPStainless steel pump and motor housingFor 4" inside diameter or large wellsPump wires direct to pressure switchRequires no control box - 2 wire 115 voltIncludes built-in check valvePumps 8.6 GPM at 100 ft.Pumps up to 150 ft.SIZE:1/2 HP.. SHALLOW WELL JET PUMPCast iron shallow well pump for wells to 25 ft.Capacity up to 8.5 GPM @40 PSI w/ 5 ft. depthWill pump 4.6 GPM @ 25 ft. depthReady to install 115 volt - 9.4 amp motor1-1/4" NPT suction & 1" NPT dischargePreset pressure switch w/30-50 psi setting1 year warranty - UL ListedDESC:1/2 HP.. DEEP WELL PUMPStainless steel pump and motor housingFor 4" inside diameter or larger wellsPump wires direct to pressure switchRequires no control box - 2 wire, 230 voltIncludes built-in check valvePumps 11.9 GPM at 150 ft.Pumps 7.4 GPM at 250 ft.Can pump up to 300 ft.SIZE:1 HP..
GEYSER SUBMERSIBLE PUMPThermoplastic body resists stress & heatOil cooled motor provides high efficiencyBuilt-in thermal overload protectionVent relief prevents air lock1-1/4" NPT discharge with garden hose adapterPumps floor dry to 1/8"; fits into 6" openingReplaceable 8 ft. cord with grounded plugPumps 1020 GPH @ 10 Ft. - 1 year warrantySIZE:1/4 HP.. DEEP WELL PUMPPump wires direct to pressure switch2-wire model requires no control boxIncludes built-in check valvePumps 8.6 GPM @ 100 ft.Pumps up to 150 ft.230 voltsSIZE:1/2 HP.. SUBMERSIBLE UTILITY PUMPNon-clogging vortex impeller3/4" adjustable dischargeTop suction drains down to surfaceQuick-disconnect 9 ft. power cordNo. VIP15 pumps 780 GPH at 10 ft.No. VIP25 pumps 1020 GPH at 10 ft.SIZE:1/4 HP.. DISCHARGE HOSE KITFor use with all types of sump pumpsTakes water from basement away from houseContains 24 ft. hose, male adapter & clampIndividually packaged in clear plastic bagSIZE:1-1/4".. DISCHARGE HOSE KITFor use with all types of sump pumpsTakes water from basement away from houseContains 24 ft. hose, male adapter & clampIndividually packaged in clear plastic bagSIZE:1-1/2"..
PEDESTAL SUMP PUMPThermoplastic pedestal sump pump2,270 GPH at 10 ft.Black with gray motor12" sumpSIZE:1/3 HP.. SUBMERSIBLE SUMP PUMPCast-iron constructionFits sump basins with 11" diameter or smallerOverload protectedFloat switch designTop suction prevents cloggingCDU-790: 2700 GPH at 10 ft. liftCDU-800: 3150 GPH at 10 ft. lift3-year warrantySIZE:1/2 HP.. EMERGENCY BACK-UP SYSTEM12-volt standby systemFloat switch for automatic operationBuilt-in check valveBuilt-in alarm systemWorks off automotive or marine batteryBattery Not included1300 GPH at 6 ft. lift1-year warranty..
PORTABLE UTILITY PUMPStainless-steel pump housingPumps up to 720 GPH1" NPT suction and discharge threadsGarden hose adapter included120V continuous-duty motor1-yr. warrantyUL listedMeets CSA standardsSIZE:1 HP.. SUBMERSIBLE SUMP PUMPMechanical float switchFits 11" crock or smallerThermoplastic top & base4-pole motor is overload protected1-1/2" discharge2500 GPH at 10 ft. lift1-year warrantySIZE:1/3 HP..
SWITCH KIT FOR CDU/SPFSwitch kit for float switch pumpsGaskets included.. SUBMERSIBLE UTILITY PUMPNon-clogging vortex impeller3/4" adjustable dischargeTop suction drains down to surfaceQuick-disconnect 9 ft. power cordNo. VIP15 pumps 780 GPH at 10 ft.No. VIP25 pumps 1020 GPH at 10 ft.SIZE:1/5 HP.. SUBMERSIBLE SUMP PUMPTethered pump switchFits 14" crockThermoplastic top & base4 pole motor is overload protected1-1/2" discharge2500 GPH at 10 ft. lift1-year warrantySIZE:1/3 HP..
TETHERED SWITCHFor sump & sewage pumpsPiggy-back design with 9 ft. cordFor pumps up to 1/2 HP115 volt, 13 amp.. SUBMERSIBLE SUMP PUMPCast-iron constructionFits sump basins with 11" diameter or smallerOverload protectedFloat switch designTop suction prevents cloggingCDU-790: 2700 GPH at 10 ft. liftCDU-800: 3150 GPH at 10 ft. lift3-year warrantySIZE:1/3 HP..
1/3 HP EFFLUENT PUMPCast iron motor and pump housingVortex style impellerReplaceable piggyback tether float switch2" NPT discharge for up to 3/4" solidsUpper ball bearing for quiet operation-long lifeGPH @ 0' - 3900, GPH @ 10' - 2900Designed for domestic septic tank applicationsSIZE:1/3 HP..
1/3HP SUBMERSIBLE SUMP PUMPImpact & corrosion resistant housingTop suction intake filters debrisHigh-torque, 120 volt motorTethered float switch for basins 14" or widerFor normal water removal1-1/2" NPT discharge connects to plumbing..
1/6HP SUBMERSIBLE UTILITY PUMPPerforms continuous duty applicationsDrains flooded basementsEmpties water filled boatsRemoves water from: sinks, tubs-stock tanks and flat roofsImpact resistant housing, volute & impellerWith 1-1/4" discharge & garden hose adapterOil-free motor removes 3,000 GPH of water..
PEDESTAL SUMP PUMP SWITCH KITFor PTU, SPV & BPV series pedestal sump pumps..
PEDESTAL SUMP PUMPCast-iron baseImpeller will not corrodeMechanical float switchReplaces pedestal & submersible pumps12" sumpNo. SPV-500 pumps 2100 GPH at 10 ft.SIZE:1/3 HP..
PORTABLE UTILITY PUMPElectric utility pumpCan boost line pressure by up to 400 PSIOne-piece aluminum pump housing3/4" brass hose adapter connects to hoseProvides suction strainerIncludes extra set of motor brushesSIZE:1/2 HP.. CHECK VALVEFor use with all types of sump pumpsKeeps water from returning to sump basinReduces noiseIncludes 1-1/4" reducer bootFor use with 1-1/4" or 1-1/2" OD pipeSIZE:1-1/2"..
12 VOLT CAMOUFLAGE MULTI-PURPOSE PUMP1/10 HP non-submersible 12 volt DC pumpDesigned for outdoor; hunting, camping & fishingUse to pump out boat bilge & stock tanks, water-transfer for washing RV or ATV plus other usesStainless steel pump head & steel motor coverInlet & outlet easily connects to a garden hoseSlip resistant rubber feet keeps pump in placePumps 300 GPH to 175 GPH at 25 foot height..
RED LION SHALLOW WELL JET PUMPIdeal for supply of water for homes, farms -& cabins that have suction lifts down to 25 ft.High performance with rugged cast iron casingHeavy-duty dual voltage (115/230 Volt) motor -with capacitor for increased starting powerPressure switch pre-set at 30/50 PSIProduces up to 50 psi with automatic shut-off1-1/4" FNPT intake - 1" FNPT discharge..
ALUMIMUM WATER TRANSFER PUMP KITPortable gas powered pump for liquid transferAir cooled, 4 stroke OHV 179cc gas engineHas 2" intake and dischargeSelf priming to 25 ft. of suction liftMaximum flow: 150 GPMComes with pump, 12' reinforced suction hose -with steel suction strainer, 50' lay flat -discharge hose with couplers & 2 adapters..
2 HP SPRINKLER PUMPIdeal for both residential and commercial lawns Rugged cast iron casing and base for a long lifeEasy to prime with no additional priming after -initial fill (up to 25') ..
RED LION SHALLOW WELL JET PUMPIdeal for fresh water supply to home, farm,-& cabins that have suction lifts down to 25 ft.Pump features: self priming, rugged cast iron -casing, 1-1/4" NPT suction, 1" NPT discharge30/50 PSI pressure switch w/pressures to 66 psiGlass filled thermoplastic impeller & diffuserCan be set for use with 115V or 230V2 year over-the-counter warranty..
1 HP IN-GROUND POOL PUMPHigh-flow pump with integral trap for use with -in-ground swimming pools up to 43,200 gallonsCorrosion resistant thermoplastic housingIncludes quick connection unions, extra-large -capacity trap-basket with see-thru lidMaximum capacity: 86 GPM - Maximum lift: 8 ft.Max PSI: 28 PSI - adjustable dual 115/230 voltsSpecial designed base dampens sound & vibration..
1-1/2 HP IN-GROUND POOL PUMPHigh-flow pump with integral trap for use with -in-ground swimming pools up to 53,800 gallonsCorrosion resistant thermoplastic housingIncludes quick connection unions, extra-large -capacity trap-basket with see-thru lidMaximum capacity: 112 GPM - Maximum lift: 8 ft.Max PSI: 32 PSI - adjustable dual 115/230 voltsSpecial designed base dampens sound & vibration..
1-1/2 HP SUBMERSIBLE PUMP CONTROL BOX1-1/2 HP control box for 3-wire submersible -well pump - fits FP3242For well depths up to 400 ft.Franklin compatible box..
1-1/2 HP THERMOPLASTIC SPRINKLER PUMPCorrosion-resistant, self priming sprinkler pumpRugged, heavy-duty fiberglass-reinforced -thermoplastic housingCapable of operating up to 30 sprinkler headsMaximum lift: 25 ft. - maximum capacity 67 GPMFlow at 10 ft. lift & 30 PSI: 45 GPMSuction & discharge pipe size: 1-1/2" NPT230V / 115V dual voltage - UL & CSA Listed..
2 HP THERMOPLASTIC SPRINKLER PUMPCorrosion-resistant, self priming sprinkler pumpRugged, heavy-duty fiberglass-reinforced -thermoplastic housingCapable of operating up to 30 sprinkler headsMaximum lift: 25 ft. - maximum capacity 69 GPMFlow at 10 ft. lift & 30 PSI: 45 GPMSuction & discharge pipe size: 2" NPT230V / 115V dual voltage - UL & CSA Listed..
1-1/2 HP CAST IRON SPRINKLER PUMPRugged, cast iron pump housing sprinkler Strong enough to manage large sprinkler zonesSelf-primingMaximum capacity 55 GPM - Maximum lift 25 ft.Flow at 10 ft. lift & 30 PSI is 42 GPMThreaded ports for pressure gauge & drain plugCheck or foot valve required - sold separately230V / 115V dual voltage motor..
PUMP DISCHARGE TEERugged, galvanized construction For use with all pumps with 1" or 1-1/4" -discharge tapping(excluding deep-well submersibleDesign allows for pressure gauge installationMaking priming simple - remove top plug & fill1"MPT connection to pump - 1" FPT discharge side..
1/3 HP THERMOPLASTIC PEDESTAL SUMP PUMPFlotec thermoplastic body 1/3 hp sump pumpFlow at 10 ft.: 2460 GPH - max capacity 3000 GPHVertical switch Switch On level: 10-1/2"/Switch Off level 2-1/2"Minimum sump diameter & depth: 12"Discharge pipe size: 1-1/4"115 Volt - 3.5 Amp - comes with 6 ft. cordRecommended breaker 15 Amp - CSA and CUS Listed..
FLOTEC 1/3 HP CAST IRON PEDESTAL SUMP PUMPCast iron base with stainless steel columnFlow at 10 ft. lift: 2700 GPHMaximum capacity: 3480 GPHSwitch on level: 10-1/2" - off level: 2-1/2"Discharge pipe size: 1-1/2" FNPT1/3 HP - draws 3.5 Amps - comes with 6 ft. cord115V - recommended breaker 15A - UL ListedOperates in 12" basins or larger..
1 HP TWO-SPEED IN-GROUND POOL PUMPHigh performance, designed to move large -amounts of water; for pools up to 43,200 gal.Includes large capacity trap with see-thru lid230 volt only motor with high & low speeds1 HP on high / 1/6 HP on low to save energyEasy installation w/quick connection unionsMaximum capacity: 70 GPMSpecial design base dampens sound & vibration..
1-1/2 HP TWO-SPEED IN-GROUND POOL PUMPHigh performance, designed to move large -amounts of water; for pools up to 53,800 gal.Includes large capacity trap with see-thru lid230 volt only motor with high & low speeds1-1/2 HP on high / 1/4 HP on low to save energyEasy installation w/quick connection unionsMaximum capacity: 85 GPMSpecial design base dampens sound & vibration..
BRASS & STAINLESS STEEL FOOT VALVEProvides action of check valve & stainer -in one unitFor use as inlet of suction pipeUsed to keep prime on pumpCorrosion resistant lead-free brass bodyStainless steel screenNPT threaded connectionMeets requirements for lead free applications..
BRASS CHECK VALVELead-free brass construction valveNPT threaded inlet & outlet connectionsPoppet style with stainless steel spring..
PUMP UP TANK FLOAT SWITCHPump-up style float switch used in a tank, -barrel or other reservoir that needs to stay -full of waterWhen the float hangs down, it will allow -power to flow through to your pumpPiggyback plug for simple electrical connectionTethered style for customized installationUL Listed..
1/3 HP CAST IRON SUMP PUMPSubmersible all cast iron body sump pumpVertical float switch has Float Guard to -protect from switch hang-upsTop suction design eliminates air locks and -clogging from debris in bottom of sump pitFor use in 11" diameter or larger sump basins9" On level & 4" Off level - 1-1/2"NPT dischargeFlow Rate: Max 3800 GPH - 2700 at 10' height..
1/2 HP CAST IRON SUMP PUMPSubmersible all cast iron body sump pumpVertical float switch has Float Guard to -protect from switch hang-upsTop suction design eliminates air locks and -clogging from debris in bottom of sump pitFor use in 11" diameter or larger sump basins9" On level and 4" Off level1-1/2"NPT discharge - maximum flow rate:4200 GPH..
WATERBUG 1/6 HP UTILITY PUMPMulti-flo technology allows easy selection of -appropriate discharge for applicationTop discharge is perfect for tight spaces -where water removal is neededSide discharge for water removal from flat -open surfaces: flat roofs, basements etc.Removes water down to 1/16" of surfaceStrainer to filter debris, with 10' power cord..
RED LION CAST IRON SUMP - EFFLUENT PUMP1/3 HP automatic submersible sump/effluent pumpHeavy-duty cast iron construction for rapid-heat dissipation & extended lifeClog-resistant design - capable of passing -1/2" diameter semi-solidsIntegrated snap-action float switchOperates in basins 11" in diameter or greaterSwitch ON at 8" to 11", OFF: 2" to 5"..